Johnny Appleseed GPS can provide electronic map solutions for field staff using consumer level GPS. Choose handheld or vehicle navigation devices, or both. 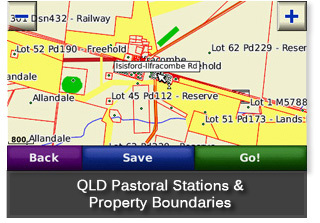 The map data will be customised to suit your business, and objectives. Call 07 3717 8555 or email gis@ja-gps.com.au for information on how Johnny Appleseed GPS can provide a custom mapping solution for your organisation. Johnny Appleseed GPS has the tools and expertise (with technology supplied by Garmin), to create your own map and data sets to assist with field work, visits to asset points, and collection of performance criteria. Information on "where was I today" can be downloaded to computer. Using technology provided by Garmin, we can produce custom maps that can be loaded to Garmin handheld GPS or in-car navigators, using ESRI shape files or MapInfo inputs. Data can include any point, line, and polygon data, including cadastre, asset locations etc. You retain copyright on all map data you supply. Map entities can be labelled and searched for on the Garmin GPS, and a route from your current location can be calculated. Voiceless or voice guidance depends on the model of GPS. Maps can be locked to a particular GPS or any number of GPS, to prevent unauthorised copying. You can have a custom map viewer on your computer, showing your maps & data. Individual files of "where was I today" can be stored along with various categories of point data created by field staff, or created on the computer. You might lower the cost of deploying your dataset to field staff - waterproof, colour handheld GPS, or consumer level vehicle navigators capable of showing your custom mapping start from $235 inc GST. With your own map data and imbedded points of relevance, you can expect improved safety & efficiency, and a speedy return on your investment. Voice navigation to addresses, or your own facilities, is automatic for Garmin PND (personal navigation device) units. Some have large 17cm screens, and multiple destination calculations. Handheld GPS will also calculate routes without voice. You will be able to search and route by customer name, facility ID, or any other criteria which you want in your data set. 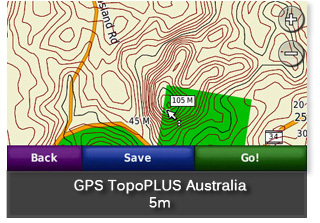 See the map data which we have already created for general use in Garmin PNDs and handheld GPS. 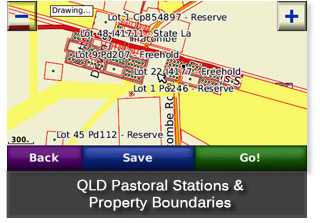 Contact us at 1800 477477 to discuss how we might assist your map solution today. 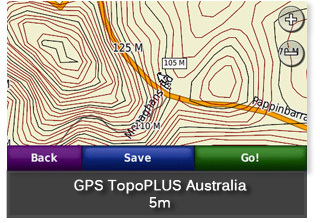 Contains contours at 5m vertical intervals, that can be loaded to most Garmin mapping GPS. 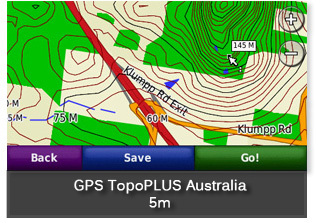 The mapping can displayed simultaneously, and overlayed with other Garmin mapping products when viewed on a Garmin GPS. This package includes licensed software that incorporates technology provided by Garmin. 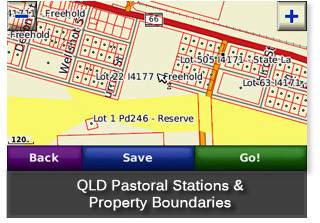 Queensland Pastoral Stations & Property Boundaries, including DCDB, stock routes, national parks, property names, state forests, and protected areas, is a mapping product designed for use with most Garmin GPS units.